Given our experience creating summer camp activities, it is not too often that the popularity of an activity offering surprises us. 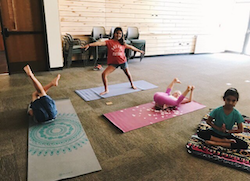 When counselors started offering camper-friendly yoga, and campers kept choosing the activity over and over again, admittedly, we did scratch our heads for a moment. However, we are super psyched on getting campers stretched, limber, and strong in kid-friendly yoga sessions! With gaining popularity, we want to offer all kinds of fun yoga games ranging from “yoga elimination” (don’t worry – it’s friendly) to “mountain top yoga” to “choose your own adventure yoga”.